Ideal and adapted for stays close to Piazza Bellini in Naples, enjoy your stay in the city center, close to monuments in Naples, modern and innovative small hotel a few minutes from Piazza Bellini, well located youthful and fresh. 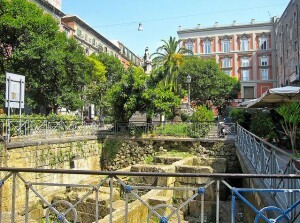 Close to public transport and the stops of the subway stations is Piazza Dante Montesanto. La Piazza Bellini was always a place of intellectual meeting in Naples, very close to the Academy of Fine Arts, and universities in the area. The name comes from the composer Vincenzo Bellini who was a student of the nearby Conservatory. Within this square are some findings of the walls of the Greek Neapolis and is at the crossroads of three major roads: Via Port’Alba, Via San Sebastiano the way of music, by the way of Constantinople which then leads the National Museum. At night, the square comes to life, we find many bars and popular restaurants in the area where you can eat the great Neapolitan Squares, the area of the nearby Piazza Bellini, you can reach from HOTEL THE FRESH 5-minute fast walk.